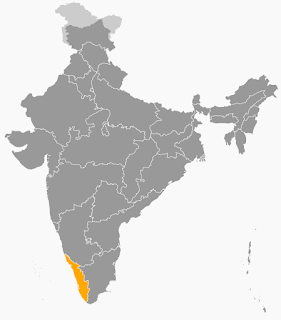 Travancore State ( Old name of Kerala) was formed on 1 July 1949 which was later renamed as Kerala. Under the States Reorganization Act of 1956, Travancore, Cochin and Malabar states were united to form the state of Kerala on 1 Nov 1956. The Laccadive Minicoy and Amindivi islands off the coast of Malabar were removed from kerala and declared Union Territory with new name Lakshdweep Islands. In 1991, this state became the first fully literate state of India. Third most densely populated state in India. First baby friendly state in India. Ernakulam is the first baby friendly district. Kottayam is the first municipal town in India to attain full literacy (1989). Ernakulam is the first district in India to attain fully literacy (1990). The important minerals of the state are ilminite, monozite, zircon, clay and quarts. Kochi known as the Queen of the Arabian Sea is the major port of Kerala. Allapuzha is known as the Kashmir of Kerala. Vellanad is the first fully computerised Panchayat in India. The first fully computer literate Panchayat in India is Tripangot in Malappuram district. Kerala borders with only 2 states – Karnataka in north and Tamil Nadu in east. Anamudi or Anai Mudi is the highest peak of Kerala with an altitude of 2,695 m. It is also the highest peak of Western Ghats. Kerala has 44 rivers out of which 41 flows westwards while remaining 3 flows to east. Periyar, Pamba, Pamba, Chaliyar, Kalada, Muvatupuzha etc flows westwards while Pambar, Bhawani and Kabani flow to east. The first two literate Municipal Town Kottayam, and district Ernakulam in India are in Kerala. Palakkad is the largest district of Kerala by area. Wayanad is the largest by population. Mineral Resources of Kerala – Limonite, Rutile, Kaolin, Limestone Main Industries – Koir and Cashew based. Other industries include handloom and bamboo based industries. Agriculture Products – It accounts for 91 % of India’s rubber, 35 % of coconut, 60 % of tapioca, 32 % of paddy, tea, coffee, plantain, areca nut and almost 100 % of lemon grass oil. Kerala is the largest producer of other crops like banana, ginger, tea and coffee.